Why Didn’t Anybody See This Before? Procolophon (Owen 1876) and Diadectes (Cope 1878a, b) are sister taxa recovered by the large study. Think of Procolophon (early Triassic) as just a little Diadectes (early Permian) only tens of millions of years later. In the present and growing list of 279 reptiles and their ancestors, no other taxon shares more characters with Procolophon than Diadectes (Figs. 1, 2). DeBraga (2001, 2002) failed to include Diadectes in his dissertation and phylogenetic analysis focused on Procolophon, but instead attempted to work out turtle and Sclerosaurus relations with Procolophon. Like others before him, DeBraga considered Owenetta and Barasaurus to be sister procolophonids, but in the large study there are many intervening taxa that falsify this hypothesis. DeBraga (2001, 2002) considered Tichvinskia (complete skeleton with oversize orbits) and Contritosaurus (jaw fragment) to be sister taxa to Procolophon. I don’t have data on them. Sauorpareion and Nyctiphruretes are widely considered procolophonids due to their large orbits, but these were actually taxa that were derived from sisters to Diadectes, Stephanospondylus, Lanthanosuchus and Macroleter > all preceding Sauorpareion and Nyctiphruretes in the lineage leading toward owenettids and lepidosauriformes. Hence, if all these are considered procolophonids, then they represent steps in a grade, not a monophyletic clade. Cisneros and Shultz (2002) considered Procolophon a cotylosaur (stem reptile). Figure 1. Basal Diadectomorpha to scale and separated with colors by clade. Lee 1993 defined Procolophoniformes as the most recent common ancestor of Owenettidae and Procolophonidae and all its descendants. Unfortunately, this definition reiterates the Diadectomorpha in this study and includes the Lepidosauriformes here. Seeley 1888 (amended by Laurin and Reisz 1995) defined Procolophonidae by a series of apomorphic characters. Owen 1876 diagnosed Procolophon with a single posterolateral directed horn (spike) projecting from the quadratojugal. Several prior and traditional studies considered Diadectes a pre-reptile, a member of the Reptilomorpha, and a sister to Seymouria. Here the large study found Diadectes nested deep within the Reptilia. It’s interesting that both Procolophon and Diadectes have been discussed in relation to turtles, but, to my knowledge, never together. The large otic notch of Diadectes is also found in Procolophon. This is not a pre-reptile character, but developed by convergence in diadectomorphs that was retained in all subsequent descendants through Macroleter and absent in Nyctiphruretes and more or less continued in Barasaurus and Candelaria. Considered one of the earliest herbivores, Diadectes gave rise to Procolophon, also an herbivore. The partial secondary palates (medial arcs of the palatines) of Diadectes are not found in Procolophon or other sisters. These results reiterate the value of a large umbrella study that includes representatives from all the major reptile and pre-reptile clades. The large study illuminates previously overlooked relationships, like the Procolophon – Diadectes link. Carroll RL and Lindsay W 1985. Cranial anatomy of the primitive reptile Procolophon. Canadian Journal of Earth Sciences 22, 1571-1587. Cisneros JC and Schultz CL 2002. Procolophon brasiliensis n. sp. a new procolophonid reptile from the lower Triassic of southern Brazil. Neues Jahrbach fur Geologie und Palaontologie 2002:641-648. Cope ED 1878a. 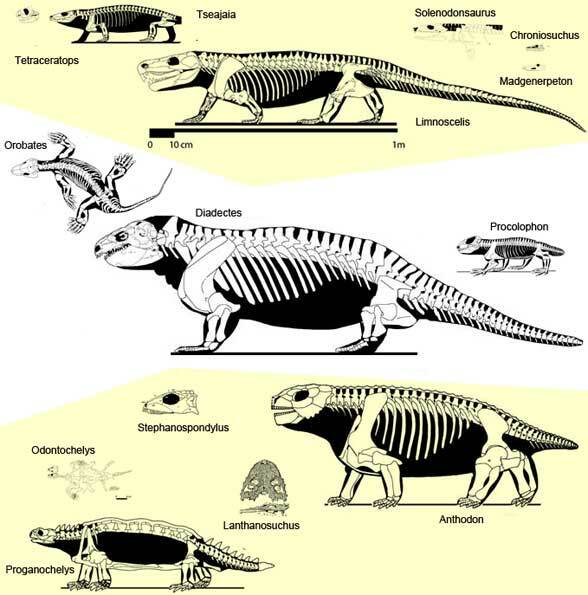 Descriptions of extinct Batrachia and Reptilia from the Permian formation of Texas. Proceedings of the American Philosophical Society 17:505-530. Cope ED 1878b. A new Diadectes. The American Naturalist 12:565. DeBraga M 2001. The postcranial anatomy of Procolophon (Parareptilia: Procolophonidae) and its implications for the origin of turtles. PhD thesis, University of Toronto. DeBragra M 2003. The postcranial skeleton, phylogenetic position and probable lifestyle of the Early Triassic reptile Procolophon trigoniceps. Canadian Journal of Earth Sciences 40: 527-556. Owen R 1876. Descriptive and Illustrated Catalogue of the Fossil Reptilia of South Africa in the Collection of the British Museum. London, British Museum (Natural History). This entry was posted in diadectomorph, procolphonid and tagged diadectomorpha, Procolophonid by davidpeters1954. Bookmark the permalink.